The Micro Plate Heat Exchangers (MPHE) features a channel plate pattern, including a dimpled surface that improves flow across the plate and utilization of the surface area for better heat transfer. 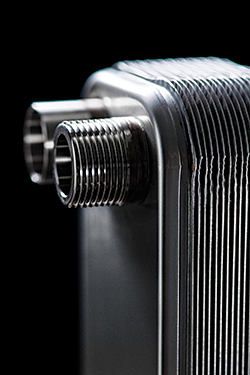 When compared with traditional brazed plate heat exchangers, have an Exchanger Index value up to 56 higher under the same working conditions, according to the company. Company offers three application-specific MPHE ranges.